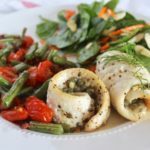 This healthy baked dill caper sole recipe from Green Chef is such a creative and nutrient dense meal that only takes about 30 minutes to whip up. 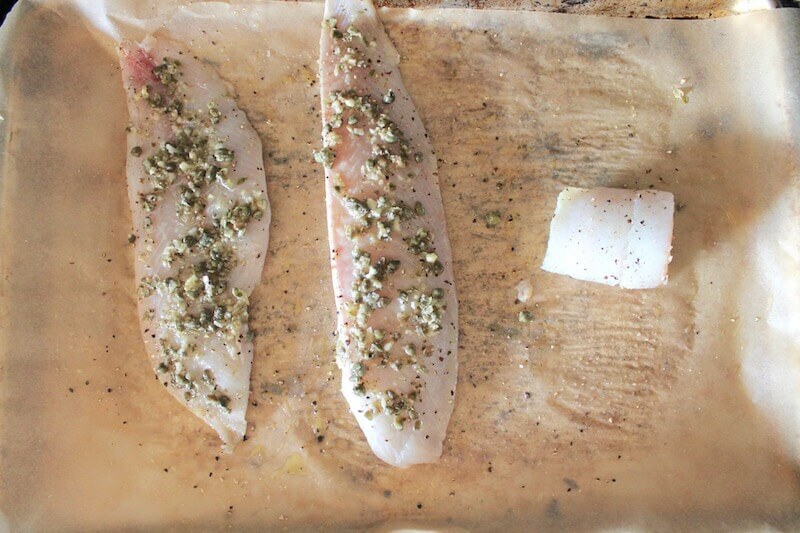 This dill caper sole recipe post is sponsored by Green Chef, but I only recommend products and services that I have personally tried and believe are of value to my readers. All opinions in this post are my own. This healthy baked dill caper sole recipe from Green Chef is such a creative and nutrient dense meal that only takes about 30 minutes to whip up when you use the pre-proportioned ingredients sent by Green Chef. I was so excited to try Green Chef because their meals are organic. 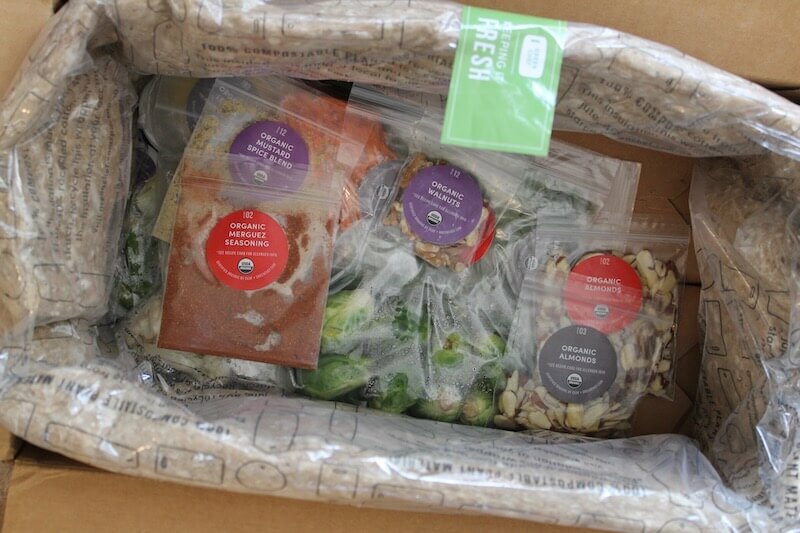 I’ve seen several other meal kit delivery services, but I haven’t seen an organic one yet…and it’s definitely needed! I myself try to buy mostly organic for my food because it’s important for our health and the environment. 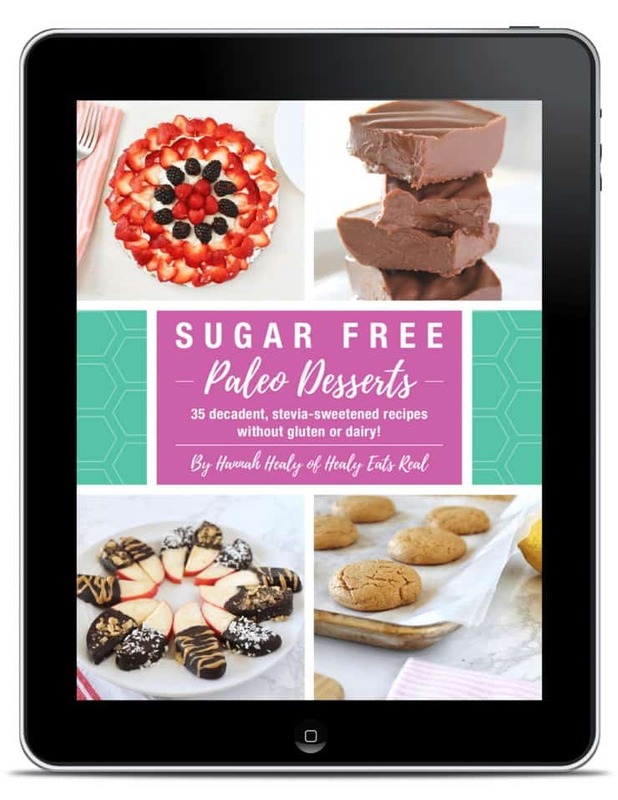 I was also excited to see that they offer gluten free, paleo and keto meal kits! They even have ones for vegetarian, vegan, omnivore and more. Green Chef sent me a kit for 3 keto meals that each serve 2 people. The kit comes in a regular box that’s super easy to pick up and isn’t too heavy. All the ingredients are packed within insulation (which is compostable by the way!) with ice packs, so everything stays cool and fresh. Once the box was delivered, I unpacked the food and put it in the refrigerator. 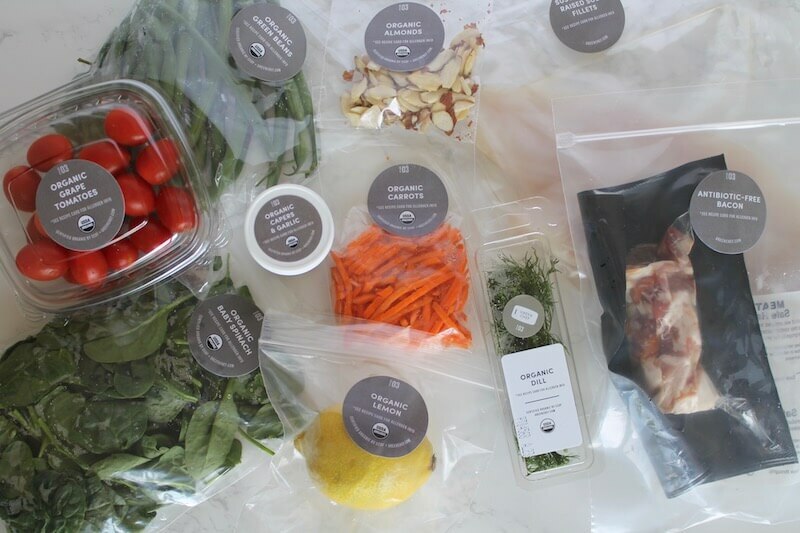 All of the ingredients for each meal is individually packaged and contains just enough for the meal, so there’s no need to worry about a bunch of extra herbs that go unused. All the ingredients are also color coded for each meal, so there’s no confusion as to which ingredient goes with which meal. It’s really easy to gather all the items for a certain meal when you’re ready to make it. Every meal takes about 30 minutes which I love because at the end of the day I usually want to whip up something pretty quickly. But for me, a quick meal ends up being a can of tuna or something boring like that. I love that these meals are new and creative and still don’t take much time to cook. 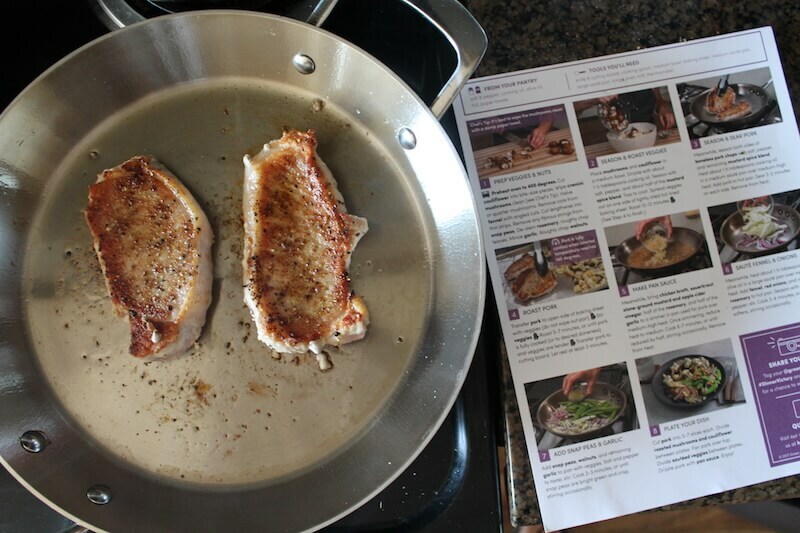 Each meal has a recipe card with step by step directions including photos so it really is fool-proof! 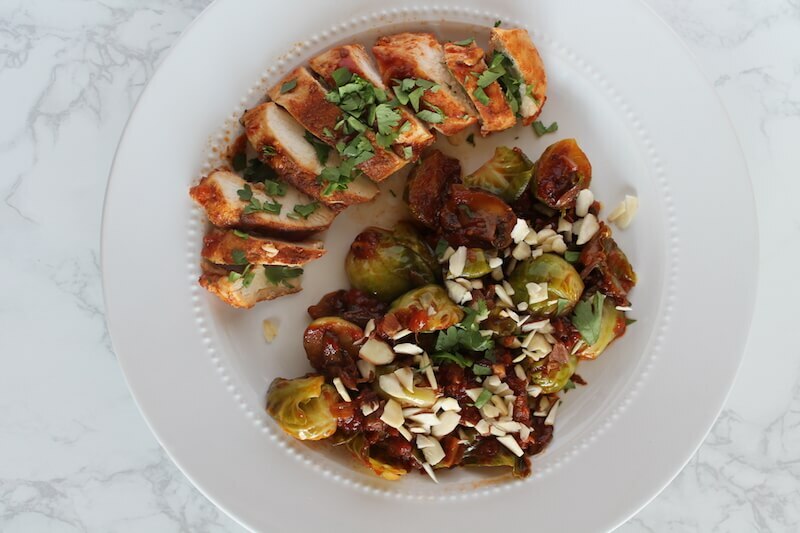 One of the best things about Green Chef‘s meal kit delivery is that it really broadens your horizons when it comes to recipes and cooking techniques. 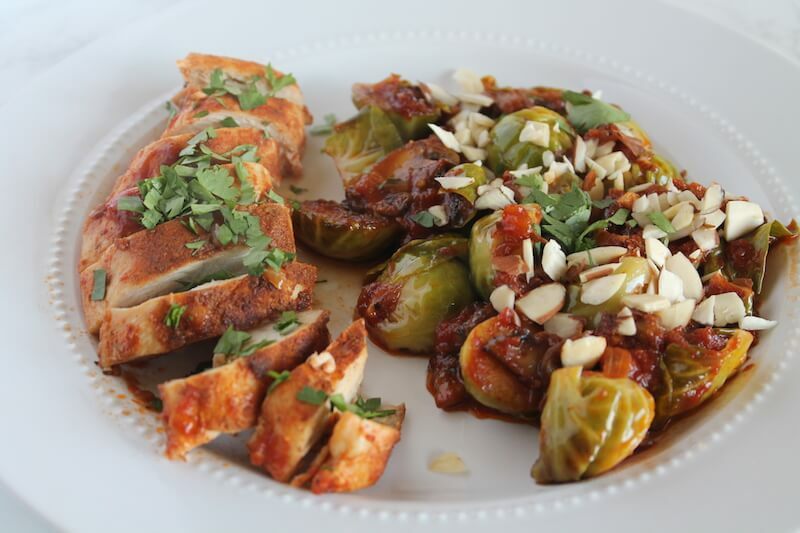 Trying these new recipe and flavor combos gave me new ideas in the kitchen. For example, when I was cooking the Mustard Roasted Pork, it had a sauce with sauerkraut and mustard. It never occurred to me to cook sauerkraut into a sauce with broth, but it turned out to be such a great sour kick to the savory pork. I can’t wait to use that idea in another recipe! Plus, you can keep the recipe cards for these recipes and make it again if you want to. Green Chef has just released new keto meals which was so perfect for me since I’m trying to lower my carbs right now. Even if you’re not keto these meals are great for keeping carbs low. Another great thing about Green Chef is that they provide nutrition facts for each meal, so if you’re counting calories or carbs or anything else it’s available on their website. Just remember that the nutrition facts may change slightly depending on how much oil you use.. sometimes the recipe will say to use 1-2 tbsp of oil. So more oil equals more fat and calories. 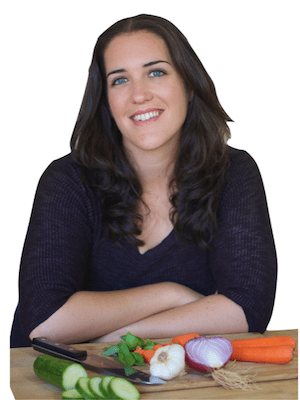 If you are on keto and maintaining ketosis, you also have the option of reducing your vegetable portion and saving it for the following day. 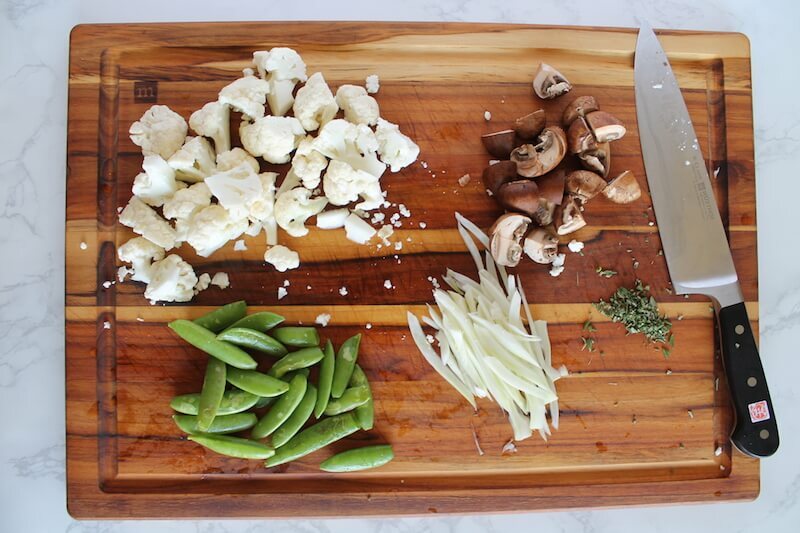 Green Chef prides themselves on veggie abundant meals, so they wanted to continue that in their keto meals. All of the recipes were sooo delicious! 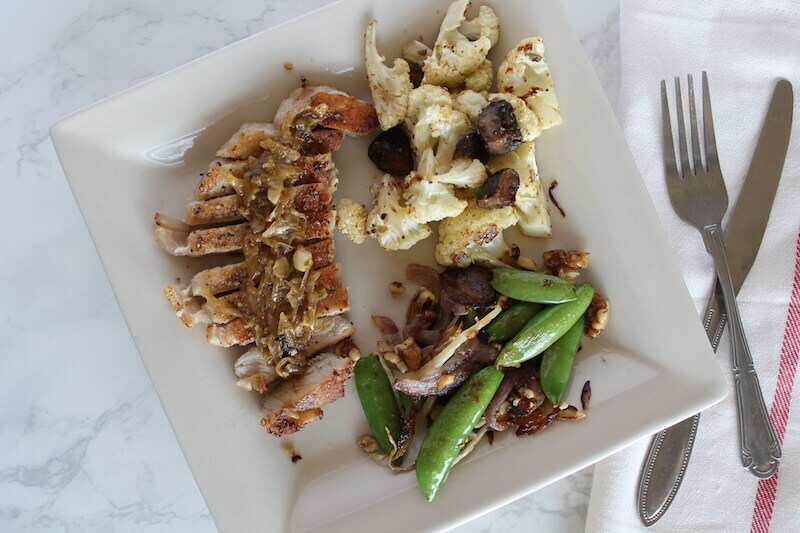 The sides paired so perfectly with the main dishes and created a rich burst of flavor and texture. Usually I’m not always the biggest fan of fish, so I was thinking that maybe the sole recipe wouldn’t be my favorite, but I loved it! Baking the fish with garlic and capers made it so flavorful. 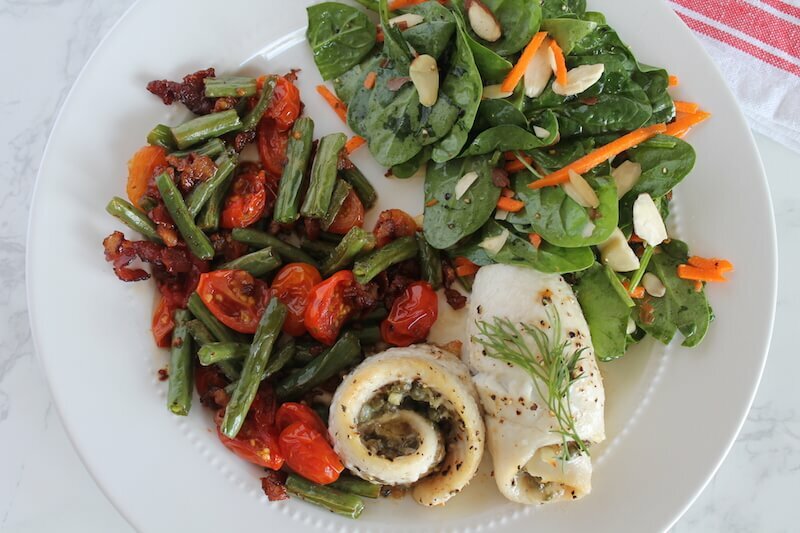 Plus taking a bite of fish along with bacon, green beans and succulent grape tomatoes was such an amazing flavor combo. My mouth is watering writing about it now! Preheat oven to 425 degrees. 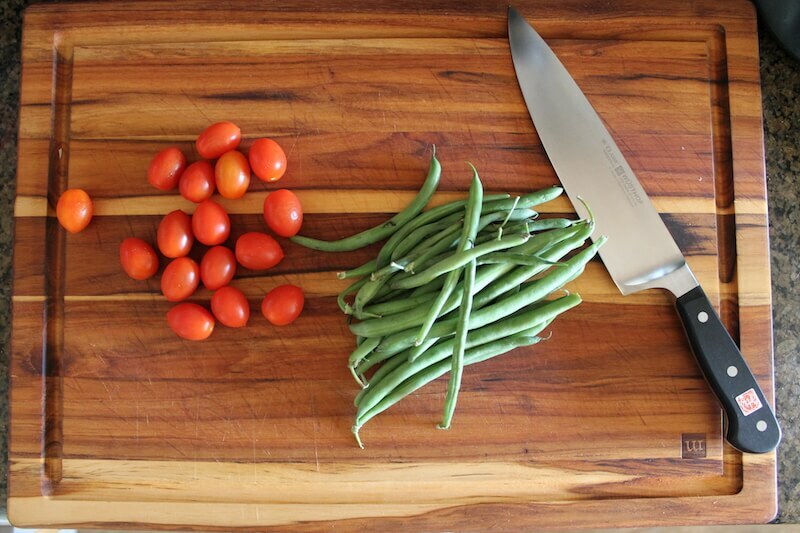 Trim stem ends off green beans. Cut into about 1-inch long pieces. Halve grape tomatoes. Roughly chop bacon into bite-size pieces. 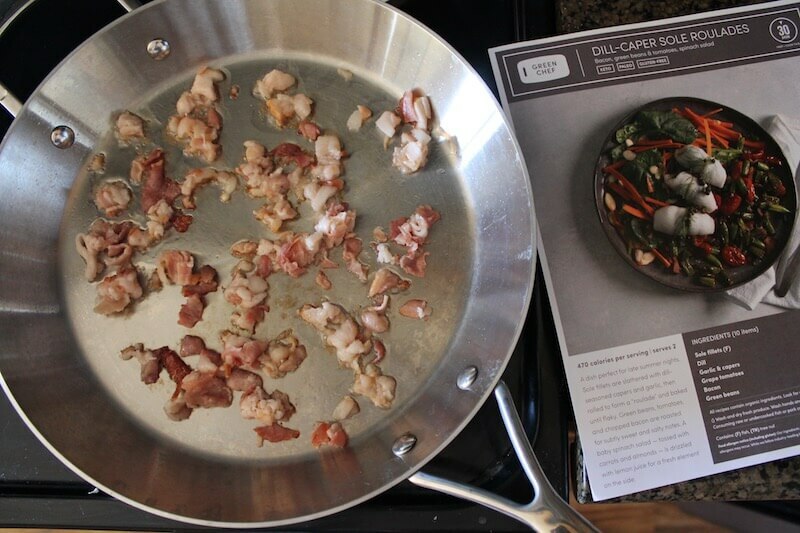 Place bacon in a dry large sauté pan over medium-high heat. Cook 2-3 minutes, or until fat begins to render, stirring occasionally. 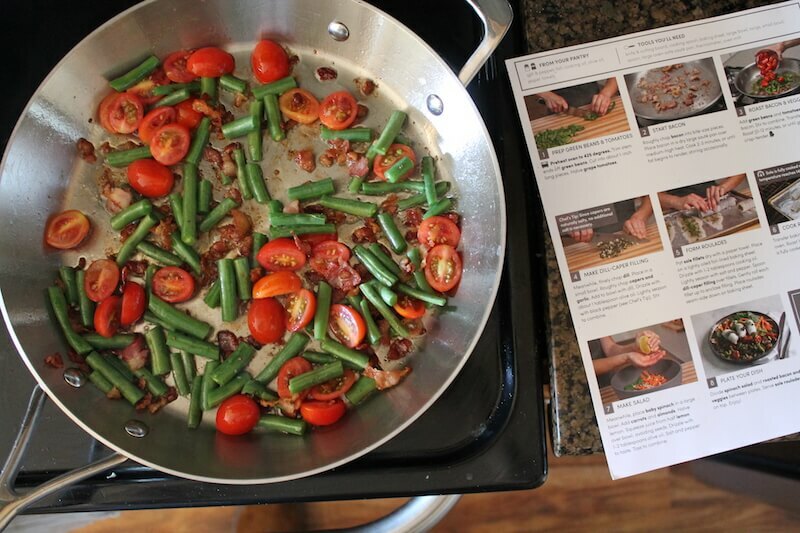 Add green beans and tomatoes to pan with bacon. Stir to combine. Transfer pan to oven. Roast 10-12 minutes, or until green beans are crisp-tender. Meanwhile, finely chop dill. Place in a small bowl. Roughly chop capers and garlic. Add to bowl with dill. Drizzle with about 1 tablespoon olive oil. Lightly season with black pepper. Stir to combine. Chef’s Tip: Since capers are naturally salty, no additional salt is necessary. Pat sole fillets dry with a paper towel. Place on a lightly oiled foil-lined baking sheet. Drizzle with 1-2 tablespoons cooking oil. Lightly season with salt and pepper. Spoon dill-caper filling over fillets. Gently roll each fillet up to enclose filling. Place roulades seam-side down on baking sheet. Transfer baking sheet with roulades to oven. Roast 10-12 minutes, or until sole is fully cooked. Sole is fully cooked when internal temperature reaches 145 degrees. Meanwhile, place baby spinach in a large bowl. Add carrots and almonds. Squeeze juice from half lemon over bowl, avoiding seeds. Drizzle with 1-2 tablespoons olive oil. Salt and pepper to taste. Toss to combine. 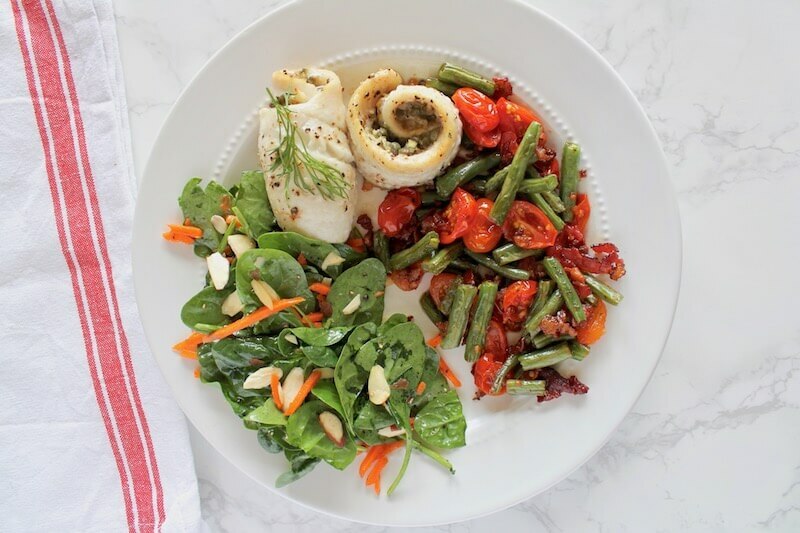 Divide spinach salad and roasted bacon and veggies between 2 plates. 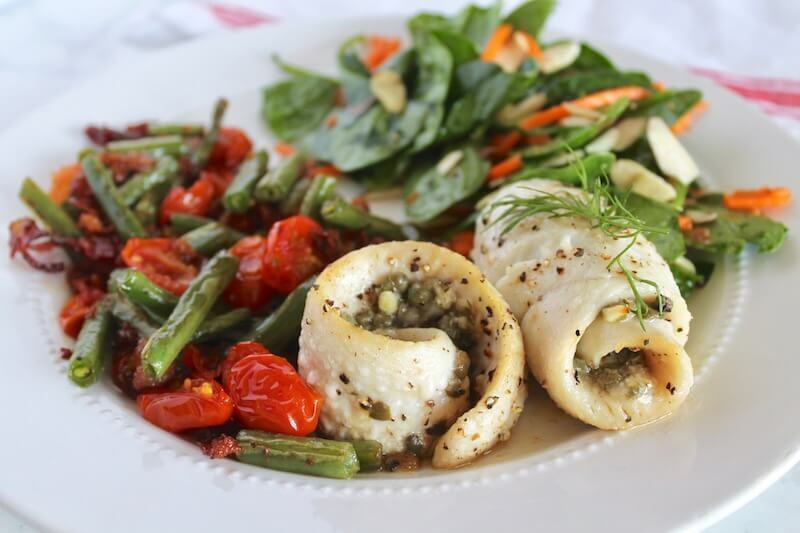 Divide sole roulades and serve on top. Enjoy! Dill is one of my favourite herbs, but I never use it enough. This is a great reminder, as it looks delicious. I’ve never tried a meal service, but this one sounds good! I love the presentation of the sole roulades. What a neat service and deliciously, well-balanced meal! With a full-time career, this would come in super handy on weeknights! This looks like such a delicious and healthy dinner. Yum! 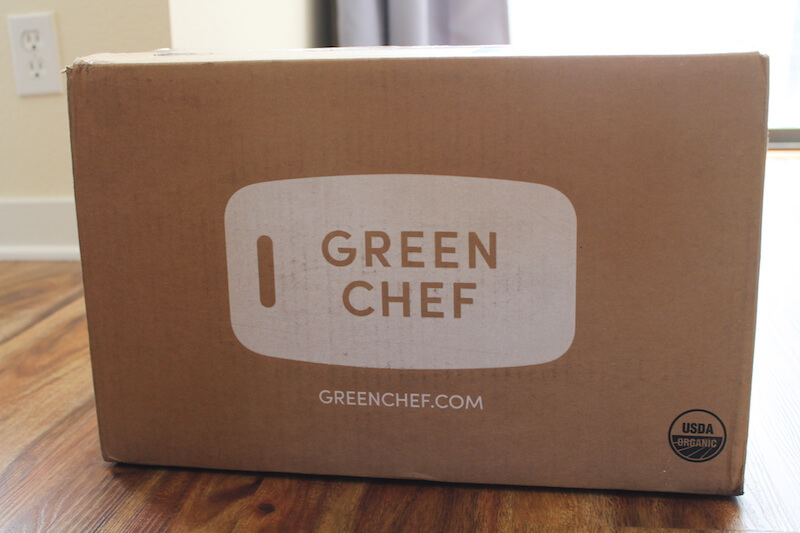 I’ve never tried Green Chef but it look great! That sole looks amazing too! These sound like amazing meals. I really struggle for ideas on a nightly basis with our family as we are all such different eaters. We live in the country so getting organic, homegrown veggies is easy for us but I have no idea how to put them into meals all of the time, so the cards would come in handy down the track to re-visit a meal that we all really liked! Thank you! We’ve been considering the meal-in-a-box services but haven’t jumped on the trend yet. Everything looks so fresh, I’m very surprised!